When Nienke and I discussed a feature interview, I was secretly thrilled. My mother was a seamstress, and she made beautiful things. 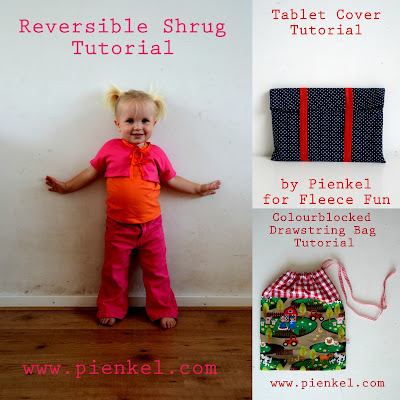 Nienke's patterns look easy to use, and I love that she also offers tutorials. To take this interview to an epic level, Nienke is from the Netherlands! Oh, and don't miss the surprise at the end of the post. Hi, I'm Nienke. I live with my husband and three young kids (a seven year old girl, five year old boy and two year old girl) on a tiny island in the Netherlands. I work freelance as an event coordinator and office manager. I am also the owner of Pienkel. It's my blog and fairly young pattern design business. My mother taught me to sew at age five, and I've loved creating ever since. I took pattern drafting and sewing classes in my spare time at high school and studied textile design for a few years. However, eventually I graduated in the more theoretical Arts Policy & Management and didn't do much creative projects anymore. That is, until my eldest was about one year old, and I discovered the amazing online sewing and blogging community. That got me back into creating at high speed. With my business, I hope to pass that same inspiration on by posting inspiration on my blog, creating free tutorials, and most of all by creating sewing patterns. I released two patterns this summer, the Hiekka skirt, a wrap skirt for girls in sizes 2y-16y, and the Dyyni skirt, a twirly basic skirt with loads of options in the same wide size range. Working freelance and starting a business kind of crept up on me. I was working part time after the eldest was born and was approached for freelance jobs in event coordination and office management. That turned into quite a business, which I still enjoy. However, I do get more personal fulfillment from my creative business. I hope to shift the balance from the office business towards the creative business in the coming years. The reason for me to dive into the business opportunities that arose, was that I love to be the one to decide how, when and where the work gets done. The best thing is, as mentioned above, being the one who decided how, when and where the work gets done, as long as it gets done. The worst part is exactly the same. I can't close the door on my business at night, it's always on my mind. What motivates you to get up every morning and design new patterns? My desire to create a solid creative business, as opposed to a side creative business. Though I had never envisioned myself as a working mom, I love to show my kids that you can do something with your talents, opportunities, and make money in a way that expresses yourself. Plus, my mind is overflowing with ideas for patterns that I want to bring to life! As a small business owner, what is the one thing you cannot live without? If it has to be really ONE thing, then I guess my smartphone. Though I'm very happy to be able to do most of my work anywhere with my laptop. I really wouldn't want to miss our paper family planner in the hallway, so the smartphone is the winner. It enables me to stay in touch with so many awesome blogging friends, existing and ones yet to be discovered via social media. It enables me to reply to email while waiting in the pickup line at school. Since my husband switched to a real smartphone as well, our shared Google Calendar is slowly starting to replace the paper family planner. Fo the most part, my creative business is what I do for fun. I love to create! Especially with textiles, but also drawing, crafting with the kids, and baking. My favorite pastime is spending time with my family, either at home or outdoors. We love to go walking or cycling. We live in a beautiful place; a small island in the Unesco World Heritage area "Waddensea". If you like to see what I mean, check out my Instagram! I am very fond of reading, but don't have much time to do so. However, I have started to turn off my beloved smartphone in the evening to do some old fashioned reading. Any advice for someone wanting to start a creative business? Take some time in advance to sit down, make a plan, check out what works or doesn't work for others. I just rolled into it. Although I really love it, I have spent quite some time in the past few years to improve things that I could have done right from the beginning if I had started with more of an idea of where I wanted to go. Nienke, you live and create in a beautiful place. Maybe I will have an opportunity to visit the Netherlands one day. Thank you for sharing your small business and creative spirit. My readers are so lucky! Nienke is offering a 20% discount with the code AGWHITAKER in her Etsy shop for the rest of 2015. Visit her shop and start creating.